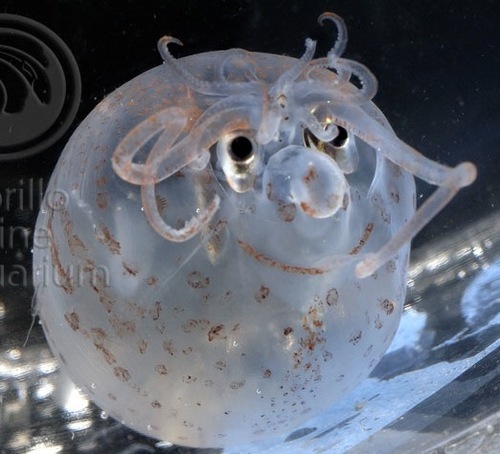 Piglet Squid, Helicocranchia pfefferi: This funny looking squid is about the size of a small avocado and can be found most commonly in the deepwater (greater than 100 m or 320 ft) of virtually all oceans. Its habit of filling up with water and the funny location of its siphon with a wild-looking ‘tuft’ of eight arms and two tentacles has prompted scientists to name it the piglet squid. I really like its nose. Awwww…it’s *smiling*! I want one as a pet!